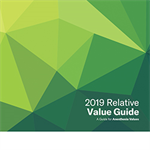 The Relative Value Guide® (RVG™) is an essential tool for all anesthesia practices. RVG provides an explanation of anesthesia coding, including definitions of base units, anesthesia start/stop time, field avoidance, reporting time for neuraxial labor anesthesia services and other important elements of anesthesia billing. RVG provides coding comments for additional information on proper code use. It also provides the ASA base unit values for each anesthesia CPT® code. 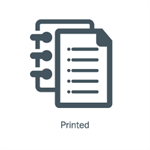 The print version is often purchased as a reference tool by those responsible for coding and billing for anesthesia services (e.g., coders, billers and health care providers), and works in conjunction with the CROSSWALK® product. For discounts on quantities of 10 or more, contact Member Services at (630) 912-2552. Interested in purchasing RVG as an eFile? Contact Member Services. ASA offers companion electronic files (eFiles) as part of the user/multi-user agreement for CROSSWALK, Relative Value Guide and Reverse CROSSWALK. Data may then be embedded directly into systems for fast, reliable search functionality. These files may be used with any software program that allows the import of these formats. Pricing for these eFiles are a flat fee plus a cost per user. For more information or to place an order, please call Member Services at (630) 912-2552. Looking for Reverse CROSSWALK®? Reverse CROSSWALK 2019 includes the CPT anesthesia codes and cross references all the applicable CPT procedure codes that may be associated with a particular anesthesia code for data analysis and research initiatives. Reverse CROSSWALK is only available as an electronic file for download. Please call Member Services to order. 3. Makes use of an output of the Electronic Licensed Product that relies on or could not have been created without the CROSSWALK, Reverse CROSSWALK, and/or RVG Editorial Content embedded in the Electronic Licensed Product even though CROSSWALK and/or Relative Value Guide Editorial Content may not be visible or directly accessible. Note: The American Society of Anesthesiologists requires a distribution license for use of the ASA CROSSWALK in any product intended for distribution in the U.S. or abroad. Please direct all inquiries to the ASA Associate General Counsel at (847) 268-9191. For discounts on quantities of 10 or more, contact Member Services at (630) 912-2552. Interested in purchasing RVG as an eFile? Contact Member Services for additional information.